Offering 28 Bulls and 20 Stud Heifers. Riverslea have committed 90 Santa Gertrudis Breeder Heifers - Ready to Join. Plus 30 Santa x Hereford x Simmental Heifers - ready to Join. Other entries include ptic Santa heifers, and Angus Heifers PTIC to Riverslea Stud Santa Gertudis bull. 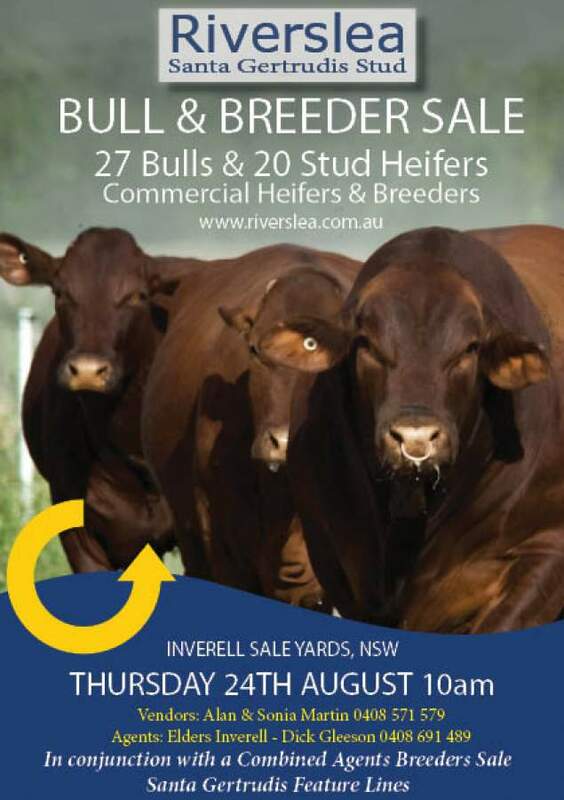 The Bull & Breeder sale is run in conjunction with a Combined Agents Breeder sale. A full listing of commercial entries will be in 'The Land' on 17th August.